← My hubby doesn’t think we are going to have baby birds. For some reason I do not understand, Penny, my cockatiel, wants to be with me all day, every day. I know that it happens, I know that it is quite common that a member of the parrot type of bird will get bonded to a human quite often. But, even though I know how common it is, I just don’t understand why. Penny is a little bird. She is smaller around than my fist, but for some reason, she trusts me with her life. Of all the places in the whole wide world, Penny would rather be with me. Sometimes, I will take Penny with me if I go my local pet shop that specializes in birds, and she will ride on my shoulder as we walk around looking at the other birds. People always ask me: “How you you get your bird to stay on your shoulder like that!” I always have to explain that the hard part is getting her OFF my shoulder at bedtime. I do trim her long flight feathers so she can’t get lost if she gets startled. I do that with Rufus, my parrot,, too, and any other bird I take outside without a cage. Trimming the long flight feathers is just like getting a haircut. It grows back just fine. When I first got Penny, she was really wild and really scared of me. 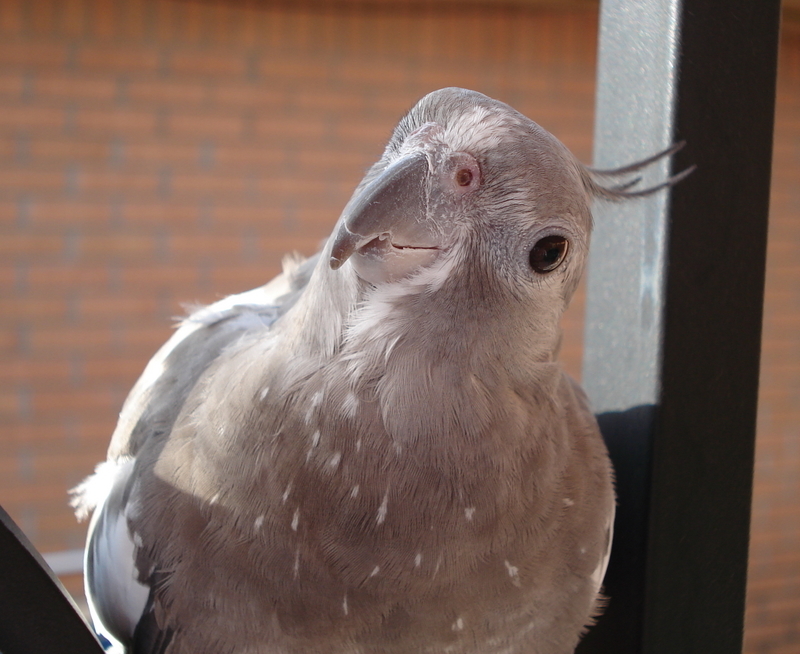 I knew nothing about birds, but I’ve had a lot of pets that I’ve trained over the years. So, using the principles I’d already known that worked, I set about trying to gain her trust. Oh, boy, did I do a good job of gaining her trust! Like I said, she is itty bitty, and she trusts me with her life. I can’t imagine how I would feel if somebody a hundred times taller than me would reach out their hand. I think I’d rather run away, than get on it. But, for whatever reason, My Pretty Penny loves me. Thank you God for giving me such wonderful companionship in my pets! Look how feather picked Alex is. Parrots pull out their feathers when they are stressed. In this video, Alex keeps asking to “go back”, he want to go back to his house. he does not want to work anymore. This video is very sad to watch. He was an amazing bird, but he was worked too hard. Sadly, Alex died last year. He was an amazing bird.